Xiaomi fans in India, prepare for some disappointing news, the Xiaomi Mi 6 won’t be launched in India,That’s according to India Today’s sources, and we think it may be right. 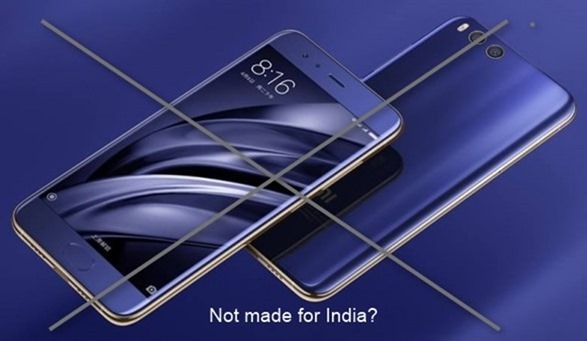 Xiaomi has never been known in India for its flagship products, and this is coming from someone who uses a Xiaomi Mi 4, albeit as a secondary device. My hopes with a flagship experience with Xiaomi, faded away in the horizon, in 2015, when the Chinese OEM did not even bother to launch a flagship phone at all. This was because of 2 reasons, the first being the infamous Snapdragon 810, which had overheating issues, and the second reason was the company’s foray into a big screen flagship waters, ala the Mi Note. When Xiaomi entered India with the Mi 3, it became insanely popular, followed by the OG Redmi Note 2. Both devices were sub 20,000 Rupees, and thanks to the budget friendly price, Xiaomi went from an unknown company to be the affordable choice in India. This is the problem there in. Xiaomi realized that the majority of Indians prefer budget Phones. but what Xiaomi failed to understand is the presence of buyers with flagship ready budgets, as is evidenced by OnePlus One, 2, 3 and 3T users. Xiaomi has tasted success with its Redmi Note 3 (which I use as my daily driver, for its impeccable battery life), the Redmi 3s Prime, and the more recently launched Redmi Note 4A, and Note 4 devices. Do you see a notable absentee in the list? That would be the Xiaomi Mi 5. The company launched its most basic variant, the one with 3GB of RAM, and 32GB of storage. On its home soil however, the Mi 5 was available in 3GB RAM/64GB and 4GB RAM/128GB variants. Xiaomi’s former VP, Hugo Barra, admitted it was a mistake not to launch the 64GB variant in India. Why? Because the Mi 5 sales in India were abysmal, thanks to the company’s policy of India not being flagship ready. Xiaomi’s treatment of India as such, has had a huge impact on a fellow Chinese company, OnePlus. Is OnePlus the bitter rival of Xiaomi? No. Because OnePlus does not cater to the mid-range market. It offers a truly premium flagship, with a budget friendly price tag. This is where Xiaomi has failed, at analyzing the market properly. Sure, more people buymid-range devices, but by not having a flagship to sell, Xiaomi is losing its potential sales to other companies. Losing Barra will likely hurt Xiaomi in India more than ever, as he was more than just an eloquent speaker, he knew the fan’s demands well. Allow me to quote the number of reviews which Amazon India lists. The OnePlus 3 (which is only available with 6GB of RAM), priced at Rs. 27,999 has 14,660 customer reviews as of April 27th, while the OnePlus 3T which costs Rs.29,999 has 9,225 ratings. That's not enough, right? Let's look at some official stats from the company. Xiaomi on the other hand makes its budget phones in India, and is the reason why its numbers are soaring. Not that it is bad, but it could have done the same for the Mi 5, or the Mi 6. The OnePlus 3T got 2 lakh registrations, when it was launched. This impressed the company so much, that it brought a 128GB variant priced at Rs.34,999, and it is in demand too. What do you think about those numbers? Are there not enough people ready to buy an affordable flagship phone? Do you still believe that India is not flagship ready, Xiaomi? If only the company had brought the 4GB RAM variant and priced it at around Rs. 24,999, things would have turned well for Xiaomi. And by not launching the Mi 6 in India, Xiaomi's loss is literally OnePlus' gain. Not only by the sales numbers we mentioned above, but also eager Mi fans who wanted the Mi 6, who may now jump ship, to a quality flagship with a similar price. It goes without saying, just how much we are looking forward to the OnePlus 5.